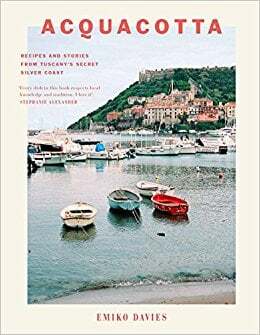 My interest in the book was peeked as it covers an area of Italy I don’t know but its terrain of sea and forest is very similar to where I live on the south coast here in the UK. I was also intrigued by the combinations of land and sea ingredients. My first foray in to the recipes was the mushroom soup. I couldn’t find fresh porcini so adapted it with a combination of 4 other fresh mushrooms as suggested. I also added the fresh chilli, which gave a satisfying gentle background heat. Calamint was impossible to find (it will now be on my ‘to grow’ list this spring) so used the oregano/mint mix, which gave a refreshing lift to the rich flavours of the soup. The recipe was a hit and will be repeated. An added bonus is if the extra liquid is omitted it makes a great bruschetta topping. 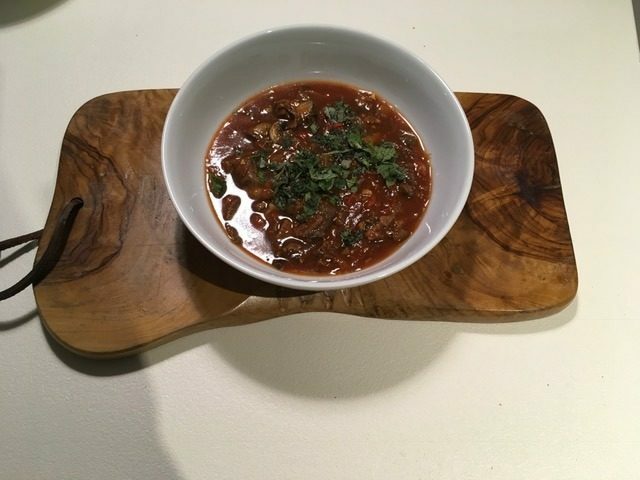 The next recipe tried was the wild boar stew. Wild boar is normally easy to obtain in my area, but not in January apparently, hence I used the alternative suggestion of venison. A guide to which cuts of meat to use would have been useful here. However, I followed the recipe to the letter (a rare event for me), just taking the meat off the bone before serving. The consensus was that it was a very tasty stew but still had rather too much liquid. It was served with the Sformati di Cipollotti as suggested, which was a great hit, albeit not a lot for 4 to mop up all the juices. Also rather rich. I wanted to try the fresh pasta recipe listed with the hare sauce recipe. I usually use a ratio of 80g OO flour:20g semolina:1 egg per serving so the 50:50 flour:semolina split to 1 egg intrigued me. It was a triumph, being really easy to work and very tasty. I made it as tagliolini to go with the sea bass ragu. Another great recipe but more a nage than ragu with so much liquid. A great refreshing recipe for summer. 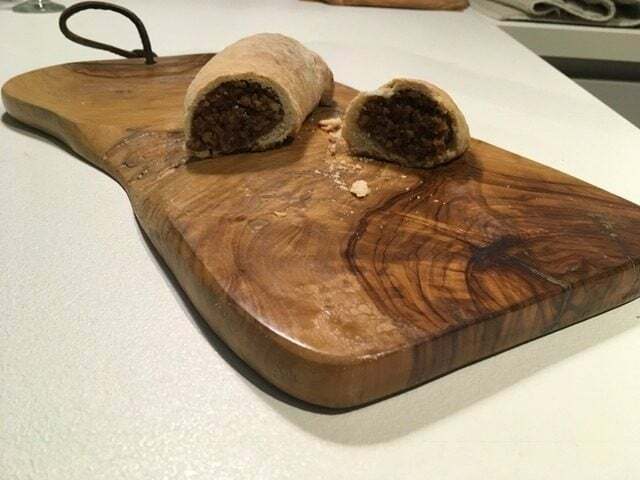 Next the pastry recipe used for the Sfratti interested me – olive oil and wine versus the norm of butter and egg with flour. The pastry was easy to make and roll out. The smell of the filling reminded everyone of Christmas. The pastry does bake hard though so the thinner the pastry can be rolled out the better. Finally I couldn’t resist the Pagnotella recipe – a healthy indulgence in my mind. Also egg and fat free to boot. 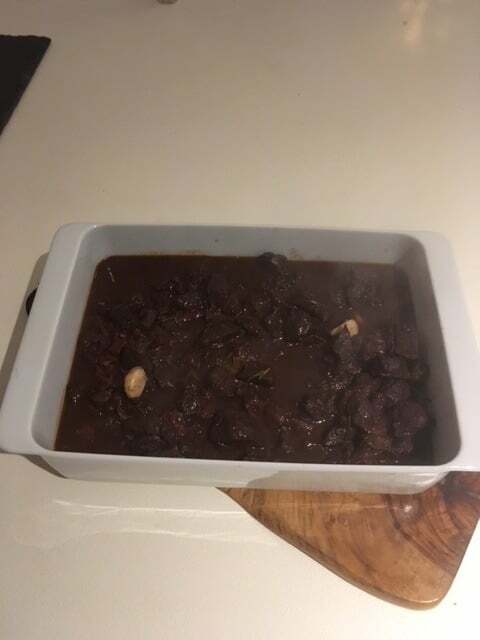 I used the suggested alternative of red wine as I thought that matched the richness of the recipe better than white. I ended up using double the flour quantity mentioned and still didn’t get the consistency referred to. I baked it anyway (in a loaf tin to make it easier to cut thin slices) and it tasted fine. Probably had a more pudding like consistency than a bread one but it was still considered a success. All in all I enjoyed the book and I will be cooking more from it. I would love to visit the area and try some of the ingredients it is difficult to find here (such as bottarga di Orbetello). It certainly isn’t a book to cook from if you don’t enjoy wine though. Nor, in my mind, is it a book for a novice. You need the confidence to follow recipes without the aid of photos and tweak them with alternative ingredients.